What are the Possible Consequences of Pre-conception Female Germ Cell Exposures on Fertility and Pregnancy Outcomes? Chemical exposures, particularly during sensitive developmental windows, can have long-lasting and devastating health impacts on fertility and pregnancy outcomes. The preconception period is a particularly important window of susceptibility because during this time period, unfertilized female germ cells can be altered by chemical exposures in ways that impair fertility and/or allow the effects to be transmitted to future generations, leading to abnormal phenotypes in the subsequent generations of offspring. During embryonic development, primordial germ cells migrate from the yolk sac to the genital ridge. These primordial germ cells undergo extensive mitotic proliferation, remaining connected by cellular bridges due to incomplete cytokinesis, and form clusters termed germ cell nests (Figure 1). At the same time, the somatic cells (i.e., granulosa cells) in the developing ovary proliferate extensively. These somatic cells eventually form a single layer around the germ cell nests (Figure 1). Then, the germ cells in the nests cease dividing and enter meiosis to form oocytes, which are arrested in meiosis I at the diplotene stage of prophase. Approximately 70% of the oocytes in the germ cell nests will die, a process that leads to germ cell nest breakdown and allows the formation of individual primordial follicles (Figure 1). The newly formed primordial follicles consist of individual oocytes surrounded by a single layer of squamous granulosa cells (Figure 1). These primordial follicles represent a finite pool of resting oocytes available to the female during her entire reproductive lifespan. Figure 1. Rodent ovarian folliculogenesis. The female ovarian follicle reserve begins to develop during prenatal development. 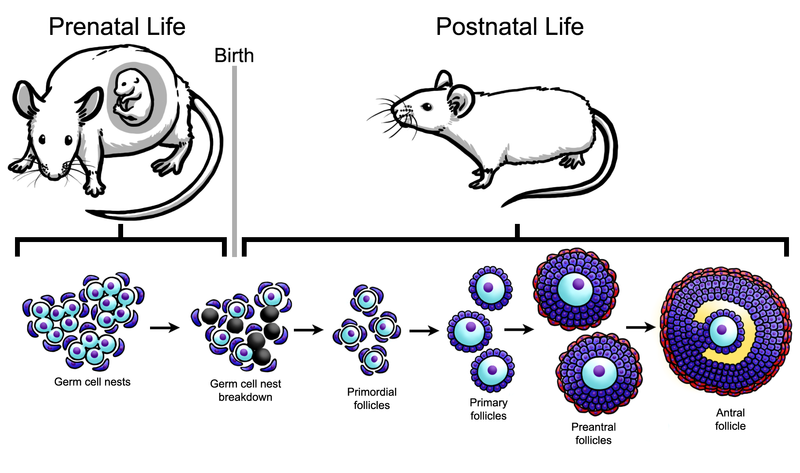 Beginning in prenatal development, the germ cell nest forms and breaks down, and during postnatal development, finite primordial follicle pool is established. Primordial follicles can mature to primary, preantral, and subsequently, antral follicles. A follicle is composed of an oocyte (shown in light blue) surrounded by somatic cells including granulosa cells (shown in dark blue) and theca cells (shown in red), depending on the follicle stage. During the reproductive lifespan, some primordial follicles grow into primary follicles (Figure 1). Primordial follicles that reach the primary stage contain a slightly larger oocyte surrounded by a single layer of cuboidal granulosa cells. Following the primary stage, follicles grow to the preantral stage, which is characterized by an oocyte surrounded by 2-4 layers of granulosa cells and the beginnings of a thecal cell layer (Figure 1). Preantral follicles grow into antral follicles, which contain an oocyte surrounded by more than four layers of granulosa cells, an antral space, and two distinct layers of thecal cells. Antral follicles are the most mature follicle type. They are the only follicle type capable of releasing an egg for fertilization and they are the major site for the synthesis of estrogens. The estrogens produced by antral follicles are essential for fertility, normal menstrual and estrous (animal) cyclicity, and maintenance of the female reproductive tract and non-reproductive tissues, including bones, vascular tissues, and the brain. Female fertility depends on the maintenance of a constant stream of growing follicles from the primordial to antral stage. Although many primordial follicles grow into antral follicles that release eggs for fertilization, approximately 99% of all follicles die via a process known as atresia. The process of atresia is an apoptotic process that is regulated by highly conserved factors in a variety of species. Such factors include members of the BCL-2 family of proteins and regulators of oxidative stress. Over time, the ovary essentially becomes devoid of follicles because they have been depleted through the processes of both ovulation and atresia. Once the ovary is devoid of follicles, the female becomes infertile and is said to have entered menopause or reproductive senescence. Preconception exposures can target germ cells or primordial, primary, preantral, or antral follicles. The degree and type of damage that ensues following preconception exposure depends on the ovarian structure that is targeted by the chemical. Preconception exposures that destroy all of the germ cells will cause permanent infertility because the female will not have any germ cells to form follicles. Exposures that destroy some, but not all, of the germ cells may cause subfertility because the female will begin her life with fewer germ cells than normal and her ovaries will be depleted of follicles sooner than normal. Examples of exposures that target germ cells include chemotherapeutic agents, polyaromatic hydrocarbons, and some plasticizers. Because the primordial follicle pool is established at birth and is non-renewable, preconception exposures that completely deplete the primordial follicle pool will cause permanent infertility, whereas exposures that partially deplete the primordial follicle pool will cause subfertility and premature ovarian failure. If a preconception exposure completely depletes the primordial follicle pool, the ovary would lack primordial follicles that could grow to the antral stage and ovulate. Further, if a preconception exposure partially depletes the primordial follicle pool, the ovary would be depleted of follicles sooner than normal and the female would experience premature ovarian failure and early reproductive senescence. Examples of exposures that target primordial follicles include chemotherapeutic agents, polyaromatic hydrocarbons, and 4-vinylcyclohexene diepoxide. Preconception exposures that destroy preantral and antral follicles may result in either temporary infertility or permanent infertility. Temporary infertility occurs if the exposure is removed and undamaged primordial follicles are able to grow to take the place of damaged preantral and/or antral follicles. Permanent infertility occurs if the exposure is not removed and follicles are destroyed as they reach the antral stage. Examples of exposures that target antral follicles include organochlorine pesticides, including methoxychlor and plasticizers, including bisphenol A and some phthalates. Preconception exposures that increase atresia of follicles may increase the rate at which follicles are depleted from the ovary and result in early menopause or early reproductive senescence. Examples of chemicals that increase atresia include organochlorine pesticides and plasticizers, including bisphenol A and some phthalates. Preconception exposures can adversely affect the ability to become pregnant, maintain a pregnancy, and deliver healthy offspring. Experimental studies in rodents indicate that preconception exposure to tetrachlorodibenzo-p-dioxin (TCDD), some plasticizers, tobacco smoke, and heavy metals can reduce fertility, increase the incidence of premature birth, spontaneous abortions, and stillbirths, and shorten gestation length. Some epidemiological studies have reported that preconception exposures to caffeine, bisphenol A, some phthalates, parabens, perfluorinated chemicals, heavy metals, cigarette smoke, and pesticides are associated with an increased risk of pregnancy loss, spontaneous abortion, preterm birth, poor embryo quality, and poor blastocyst formation. Preconception exposures can adversely affect the development and health of offspring. Specifically, preconception exposures can cause epigenetic changes in oocytes, which then get passed on to the offspring and increase their risk of disease. Experimental studies in rodents indicate that preconception exposure to some drugs, social instability, poor nutrition, smoking, environmental contaminants, and alcohol increases the risk of diseases in the offspring, including cardiovascular disease, osteoporosis, metabolic syndrome, and diabetes. Epidemiological studies indicate that preconception exposure to persistent organic pollutants, heavy metals, smoking, diet, and alcohol consumption are associated with increased risk of small birth size, miscarriage, cardiovascular disease, and diabetes in the offspring. Recent studies suggest that some preconception exposures can cause multi-generational and transgenerational effects (Figures 2 and 3). Multi-generational effects are defined as effects that occur in the generations that were directly exposed to the toxicant. Transgenerational effects are defined as effects that occur in the generations that were not directly exposed to the toxicant, thus indicating epigenetic inheritance of traits. The multi-generational and transgenerational phenomena may vary in generations depending on the timing of exposure. Specifically, exposure during prenatal life versus postnatal life leads to different transgenerational phenomena. During prenatal exposure, the F0 generation is exposed while pregnant. The F1 generation receives direct exposure as the developing fetus, and the F2 generation receives direct exposure as the developing germ cells. In this scenario, both the F1 and F2 generations experience multi-generational effects, but the F2 generation experiences preconception exposure (Figure 2). The F3 generation is not directly exposed, and any effects observed in this generation are considered transgenerational effects (Figure 2). In contrast, exposure during adult life in the F0 generation directly exposes the F1 generation as the germ-line. The F1 generation is directly exposed and effects observed in the F1 generation are considered multi-generational effects (Figure 3). Further, the F1 generation experiences preconception exposure. The F2 generation is not directly exposed, and any effects observed in this generation are considered transgenerational effects (Figure 3). Some experimental studies indicate that exposures to environmental contaminants including some plasticizers, TCDD, vinclozolin, jet fuel, some insecticides, and flame retardants cause multi-generational and transgenerational effects including obesity, reproductive diseases, reduced fertility, metabolic syndrome, and spontaneous preterm birth. Figure 2. Multi-generational versus transgenerational effects from preconception exposures (prenatal life). Schematic represents prenatal exposure that causes multi-generational effects in the F1 and F2 generations and transgenerational effects in the F3 generation. Further, the F2 generation experiences preconception exposure. Figure 3. Multi-generational versus transgenerational effects from preconception exposures (adult life). Schematic represents postnatal exposure that causes multi-generational effects in the F1 generation and transgenerational effects in the F2 generation. Further, the F1 generation experiences preconception exposure. Current studies indicate that preconception exposures adversely affect female fertility and pregnancy outcomes, but most studies have not determined the mechanisms by which they do so. Future studies are required to understand the underlying mechanisms because this will lead to the development of methods to prevent or treat adverse outcomes due to preconception exposure.